Join us for our 1st Curated Event on the main stage at Churchill's Pub. 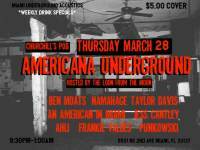 Americana Underground describes some of the best in Underground Acoustic Music ranging from Country, Folk, Acoustic Pop & Storyteller influenced sounds. Some of Miami's best underground acts will be seeing the main stage for the first time. Ben Moats, Namahage, Taylor Davis, An American in Miami, Jess Cantley, Ahli, Frankie Valdes & Punkowski will be holding down the stage for the night & we look forward to seeing you out to support these great acts. $5.00 Cover at the door goes to support the musicians & drink specials will be available all night including Happy Hour after midnight. Message us in our inbox for more information. Thanks!